1Despite suggestions that the post-9/11 era would mark the end of the “memory boom” (Klein 2000) that preoccupied critical and cultural discourses at the end of the twentieth-century (Zehfuss 2003), in the aftermath of 11 September 2001, discussions about commemoration occupied the forefront of public consciousness in the United States, as debates over the redevelopment of Ground Zero, the widespread consumption of commemorative memorabilia, and ongoing controversies over the ways in which the deaths of 9/11 victims were mobilized in support of the War on Terror, impelled unprecedented attention to the politics and ethics of memory. 2Despite the diversity of perspectives embraced by commemorative media relating to 9/11, the culture of memory surrounding the attacks has arguably been most notable for the ways in which the institutions of the American public-political sphere have sought to nationalize the trauma of September 11. 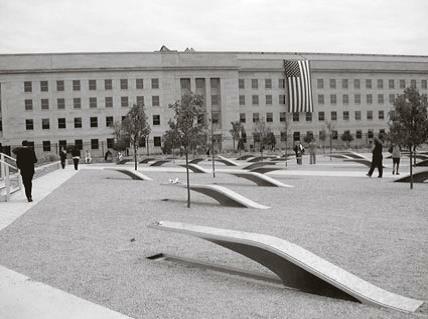 In the immediate aftermath of the attacks, President George W. Bush declared 9/11 a “national tragedy”; in December 2001, Bush designated 11 September as Patriot Day; in 2005, the True American Heroes Act of 9/11 designated a commemorative medal to “all government workers and others who responded to the attacks on the World Trade Center and the Pentagon”; and in November 2011, the Fallen Heroes of 9/11 Act awarded Presidential medals to the three memorials erected at the site of the attacks – the National September 11 Memorial in New York (designed by Michael Arad and Peter Walker), the Flight 93 National Memorial in Shanksville, Pennsylvania (designed by Paul Murdoch Architects), and the Pentagon Memorial (designed by Julie Beckman and Keith Kaseman). 3As a number of commentators have noted (Sturken 2007), such endeavours facilitated the emergence of a politicized and exclusionary culture of memory that appeared to privilege American lives over others, most notably the Iraqi and Afghan deaths designated as “collateral damage” in the War on Terror. Resistant to the development of such “hierarchies of life” (Butler 2004), critics (Rothberg 2009a; Gray 2011) have subsequently argued for a recalibration of memorial culture to engender a global dialogue about the attacks and their aftermath. Construing memory as comparative and not competitive, such discourses resonate strongly with the recent “transcultural turn” in memory studies (Bond & Rapson 2014), pioneered by theorists such as Daniel Levy and Natan Sznaider (2006), Michael Rothberg (2009b), and Astrid Erll (2011). Bond, Lucy & Jessica Rapson (eds. ), The Transcultural Turn: Interrogating Memory Between and Beyond Borders, Berlin: Walter de Gruyter, 2014. Butler, Judith, Precarious Life: The Powers of Mourning and Violence, London: Verso, 2004. Erll, Astrid, ‘Travelling Memory’, Parallax 17(4), 2011, 4-18. Gray, Richard, After the Fall: American Literature Since 9/11, Oxford: Wiley-Blackwell, 2011. Klein, Kerwin Lee, ‘On The Emergence of “Memory” in Historical Discourse’, Representations 69 (4), 2000, 127-150. Levy, Daniel & Natan Sznaider, The Holocaust and Memory in the Global Age, translated by Assenka Oksiloff, Philadelphia: Temple University Press, 2006. Rosenfeld, Gavriel D., ‘A Looming Crash or a Soft Landing? Forecasting the Future of the Memory “Industry”’, Journal of Modern History 81(1), 2009, 122-158. Rothberg, Michael, ‘A Failure of the Imagination: Diagnosing the Post-9/11 Novel: A Response to Richard Gray’, American Literary History 21(1), 2009a, 152-58. Sturken, Marita, Tourists of History, Durham and London: Duke University Press, 2007. Zehfuss, Maja, ‘Forget September 11’, Third World Quarterly 24(3), 2003, 513-528. Lucy Bond, « September 11, 2001 », Témoigner. Entre histoire et mémoire, 119 | 2014, 176-177.